It is still that time of year when mosquitos are out for our blood! And they aren’t showing signs of stopping just yet which means that we need to continue to prevent them from taking over our backyard as well as leaving us with itchy, red welts. And although it is pretty much impossible to get rid of every last mosquito, there are plenty of ways in which you can prevent them from taking over the backyard and eating you alive when you are out this summer. When it comes to the backyard, the main issue is removing any source of standing water which is what mosquitoes need to breed. When they have no place to breed, they will not be as large of a problem and you will actually be able to enjoy your backyard. Remove anything on your property that collects water including toys, cans, and plant pots. Clear out the gutters so that they do not pile up with water and debris. If the ditch has stagnant water, be sure to dig it out until water is flowing. Keep covers on pools and hot tubes when they are not being used. Wear clothing that covers the legs and arms even when it is warm outside (you’ll be grateful with less bare skin and mosquitoes chasing after you). Consider a mosquito net hat for when you have to spend time in a highly infested area. Apply insect repellent when necessary. Avoid spending a lot of time outside during the peak mosquito times which are dawn and dusk. By following these tips, you will be able to really enjoy your time outside this summer and into the fall rather than spending it flailing your arms and running away from mosquitoes. 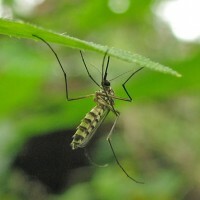 Keep in mind that not only are their bites itchy and irritating, mosquitoes can also transmit diseases such as West Nile virus.